Giveaway of $10 gift card and book! Heroine's in danger. Hero steps in to protect her. Bad guy is thwarted. But what if the hero might be the bad guy? In One Cut Deeper, everything seems great for Ranay until her new mysterious Master disappears. He's everything she's ever wanted and thought she'd never find. A kind and gentle man who's determined to build up her self-esteem after a disastrous past, mixed with the powerful, intense control of a Dominant. Even better, he's able and willing to give her the pain she needs with carefully controlled violence. Danger. Passion. Pain. She loves it all. But when he leaves, the doubts and questions start pouring in. Who is Charlie MacNiall? Is he the man she's fallen in love with? Or the serial killer the FBI warned her about? There is someone stalking her. Someone who wants to hurt her. But could anyone ever hurt her as well as Charlie? It was a simple word, but carried a multitude of questions with it. Why him? Why did I still trust him? Why did I still want him even with his ugly secret exposed? Why did I need him so much? Why would it break me as nothing else had managed to do, if he forced me to leave? Most people would think I’m nuts. They wouldn’t understand. But for me, submission wasn’t an act, a scene I played out for a limited amount of time and then walked away. It wasn’t just a mind game. Submission was my whole being. He’d gripped my chin, peered into the shattered remnants I’d put back together, and claimed that broken chalice for himself with those big, merciless hands. He treasured me, flaws and all. For that alone, I’d love him forever. Whoever he chose to be. If you enjoy darker heroes, I hope you'll give One Cut Deeper a try! For a chance to win a free copy and a $10 gift certificate to your favorite ebook retailer, leave a comment about this post recommending your favorite dark hero and his book, and I'll draw a winner! Visit Joely at her website, as well as Twitter and Facebook. Her upcoming releases include The Billionaire's Christmas Bargain November 2015 and the second book in A Killer Need series: Two Cuts Darker in February 2016. Charlie MacNiall has been bringing his beautiful king shepherd to the vet clinic where Ranay Killian works for the better part of a year. She doesn't realize he's been slowly wooing her. She certainly has no idea that he picked her deliberately—that she is to become his. A broken heart and a desperate desire to be dominated make her the perfect victim. Charlie fixes Ranay, testing her emotional limits while pushing her sexual boundaries past anything she'd imagined possible. Pain is their shared pleasure…until Charlie disappears and Ranay is all but destroyed. The FBI says the man she loves is a serial killer. Ranay can't deny there's a darkness in Charlie, a monstrous hunger that drives him to the brink. She even believes he could kill. But Charlie's hunger is what bonds them—it's the foundation of their love. Would he actually kill her? The only dark hero that comes immediately to mind is Severus Snape from the HARRY POTTER books. I finished a really good one last night, Nick Ryder from Keri Lake's Ricochet is now my fave dark hero. Thanks for the chance! I love the sound of One Cut Deeper! Wonderful post, thanks for sharing! "One Cut Deeper" sounds very intriguing. I'm looking forward to reading it. As for my favorite dark hero, I really liked Diaz from "Cry No More" by Linda Howard. It's a great book, and I would recommend it for the characters alone. 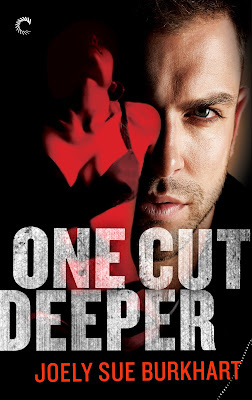 "One Cut Deeper" sounds interesting! oooh... this looks and sounds awesome! I'm gonna have to go with Angel from the Buffy the Vampire TV show. (for some reason this is the only dark hero I can think of). Thanks for sharing! Congratulations on your book, Joely. I have yet to read one with a dark hero. Oh boy... nothing specific is coming to mind... I will have to think about what I have read... Thanks for sharing a bit about your book One Cut Deeper. I think I'll go with Riddick, of the film series. An escaped, murderous convict is pretty dark, right? Thank you so much for having me and for your comments! I'm making a list of your recommendations!